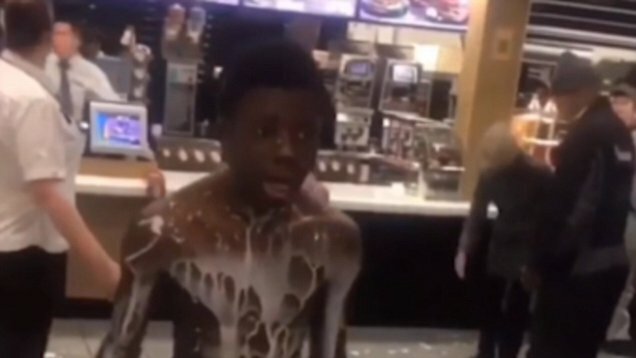 An angry McDonald's customer took off his clothes and poured milkshake on himself because staff took too long to deliver his order. In the video, the young man is seen shouting about his order, then he takes his clothes off, starting with his sweatshirt, then his shirt and finally his trousers. After this, he continues ranting as he takes two cups of milkshakes delivered to him, walks up to the counter from where staff are serving other customers and climbs on it. "I'm fu**ing done," he says and pours both cups of milkshakes on himself as other customers look on in shock. The liquid made the counter slippery and he trips and falls flat on the floor but quickly picks himself up and continues ranting.